Looking for the best way to kill off weeds in bermudagrass in 2019? Then you're in the right place! 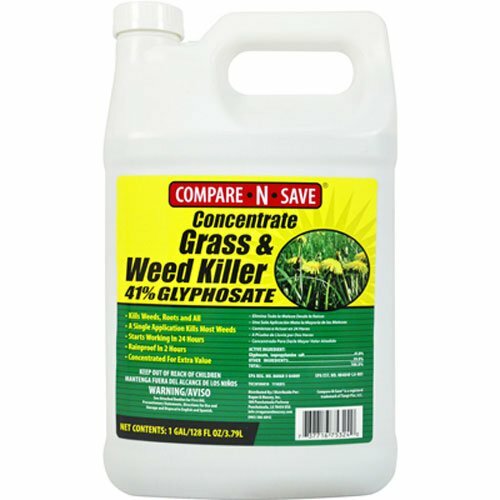 Compare-N-Save has created a winning solution in its Concentrated Grass and Weed Killer: the formula simply works, period. This spray is meant to be mixed with water, and ships to the consumer in a concentrated form. You can choose between multiple sizes based on your own individual needs (an aspect that we love), but we recommend the gallon size. It's the best bang for your buck without being too hefty on your wallet. Once you mix the spray with water, it's meant to be loaded into an external spray attachment and administered across your yard. This sprayer is sold separately, but the good news is that you can reuse these sprayers again and again for several other tasks as well. Whether you need to repel hornets or spray herbicide, this is an investment in your garden. We recommend a sprayer like this one: Chapin 20002 2-Gallon Multi-Purpose Sprayer. The active ingredient in this weed killer is glyphosate at 41%, which works from the very first application to kill weeds in bermudagrass. Customers should notice results in 2 to 4 days, and the solution becomes rainproof in a matter of only a couple of hours. To take a deeper look at the other weed killers we considered (and learn more about bermudagrass in general), read our in-depth guide down below! So, Is Bermudagrass Good or Bad? Is Bermudagrass Illegal in Some Places? This exotic-sounding turf sounds more like a tropical cousin of the Hawaiian lei necklace than what it actually is: an aggressive type of actual grass. How Can A Grass Be Aggressive? Bermudagrass has many survival characteristics which other types of grass lack, such as an ability to withstand intense heat, drought, and traffic. In addition to these strengths, bermudagrass grows in dense bundles, and can also sprout in soils that are poor in nutrients. This type of grass requires very little to survive, and can thrive in just about any environment. Due to its miraculous survival instincts, bermudagrass is able to essentially "choke out" other types of grasses in an area. It pretty much wins the game of evolution at every round—bermudagrass is able to always top the charts in terms of survival of the fittest. What Does Bermudagrass Look Like? From far away, these grass tufts are almost indistinguishable from regular-looking grass; the kind anyone would have on their front lawn. When you get a little closer, though, you can see that the coloring is slightly lighter than that of what one would consider "normal" grass. In addition to the lighter shading, you can see that instead of individual blades, there are what look like stalks with prongs attached at the top. These stalks look more like plants without flowers than blades of grass. For a close-up shot of bermudagrass, take a look at the video below! Below the surface of the soil, there's a deep network of roots that anchors the bermudagrass in place. This is another aspect which makes this grass so tough: the roots are especially intricate, which means that you'll need to find a weed killer that takes this into consideration. In its natural state, you can usually find bermudagrass growing in warm places with tons of sun...which may seem obvious, given its namesake. Think tropical and sub-tropical locations like the Caribbean and Southern half of the United States: even the Southwest! Artificially speaking, bermudagrass is often used as turf on golf courses, arenas, and sports parks due to its infamous resilience. There's little upkeep involved with this type of grass, so it's a favorite among lawnkeepers of large areas. A quick Google search for bermudagrass can lead a person astray on whether this type of grass is a positive or a negative thing to have in the yard. On one hand, it's incredibly resilient. On the other, it essentially knocks out all your other plants. Take a look below at the pros and cons of this type of turf. Read Also: How to pick a good weed whacker! Read Also: Removing weed from flower beds! Is Bermudagrass a Good Thing? If you have an athletic field or a golf course to cover, then yes. Many lawn caretakers utilize bermudagrass to cover large, sprawling areas in the most effective manner possible. Because bermudagrass requires so little upkeep, this is an ideal way to get the job done. For homeowners who don't have the luxury of a lawn caretaker, bermudagrass isn't the best option. This is especially true for gardening enthusiasts—bermudagrass will invade the space of your other plants in the garden and take over. It's not prudent to have this sort of turf covering your lawn, especially when there are less invasive options out there. The state of Utah enacted what's called the Noxious Weed Act, which is essentially a set of laws and codes to regulate weeds which are not native to that particular state. Bermudagrass falls into the Containment Category, which means that any bermudagrass found in Utah should be controlled and managed accordingly. In addition, there's a ban on new bermudagrass being placed in the state, as well. It's worth noting, however, that bermudagrass is exempt from the regulations of Utah's Noxious Weed Act within the confines of Washington County, Utah. Outside of Washington County in the state of Utah, however, bermudagrass must adhere to the provisions of the Noxious Weed Act. Compare-N-Save Concentrated Grass and Weed Killer is an ideal solution for those are are serious about having a trim and beautifully-landscaped garden without the fuss of power tools. Within just a few hours, the concentrated, rainproof solution gets to work at attacking the weeds of bermudagrass straight to the root. The active ingredient, glyphosate, works as a post-emergent herbicide. This means that it will kill weeds that have already sprouted, but will not prevent new weeds from forming. One gallon of Concentrated Grass and Weed Killer can mix up to 85 gallons of weed-killing spray, which over time can cover a surface area of 25,000 square feet! An external sprayer must be used to administer the spraying solution, which is sold separately. We recommend this product to those who want a quick, simple, affordable, and effective way to manage their bermudagrass weeds once and for all. 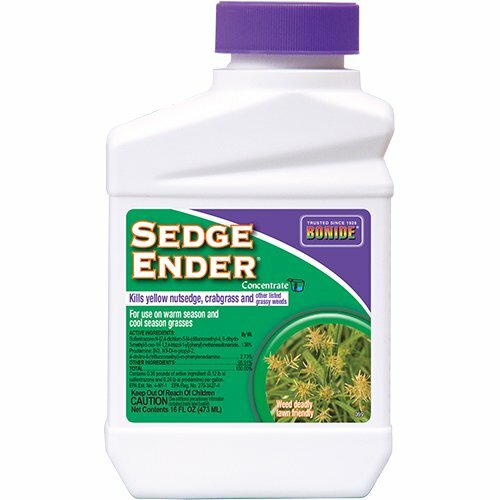 The AMES Companies Sedge Ender Weed Killer is a fantastic runner-up if you're looking for a way to kill weeds in your bermudagrass: it's effective, it's affordable, it gets the job done! So, why is it our number two choice? Well, it all comes down to dollars and cents. While both our top options are highly affordable, Compare-N-Save has definitely beat out The AMES Companies in terms of offering an economical option. Our top pick comes in a few different sizes, whereas The AMES Companies only offers the Sedge Ender Weed Killer in a 16 oz. package. Aside from the packaging, this is a stellar product. With an active ingredient of sulfentrazone boosted by prodiamine, this weed killer works to eliminate weeds that are already ruining your yard and prevent new ones from sprouting. This is a concentrated spray to be mixed manually with water and sprayed with a spraying device, which is sold as a separate purchase. 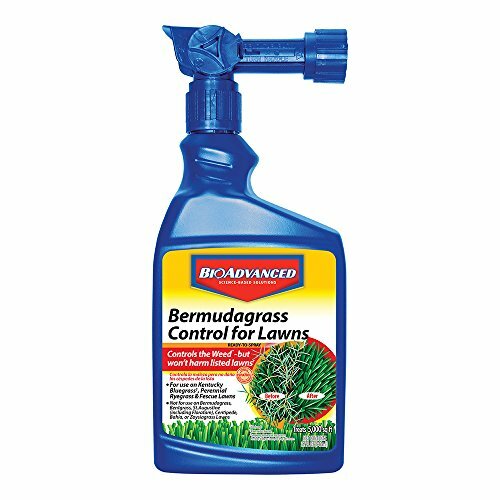 We recommend this bermundagrass weed killer to those who may not need to cover a lot of ground and don't want to spring for a full gallon of herbicide to get the job done. Despite its slightly misleading name, Bonide's Concentrated Grass Killer actually keeps grasses and lawns looking beautiful while killing off the pesky weeds! The active ingredient, sethoxydim, is a post-emergent herbicide, which means it kills the weeds which have already grown. This chemical is compounded at 13%, which is slightly higher than average for an herbicide. The product ships in 8 oz bottles and require the use of an external sprayer, which is sold separately. One mixture from concentrate can cover a range of about 1000 square feet, if used conservatively. What makes this product different from the rest is that it's safe, in particular, to use in or near vegetable gardens. If you grow your own food (or would like to in the future! ), this is the weed killer for you. Bayer is a worldwide name brand, famous for not only its aspirin, but its foray into pet medications and flea treatments as well. So it's no surprise that they've also tapped the market on something else—lawn control. Their Advanced 704100 Bermudagrass Control Spray works almost like a magic mist: with each spray, the solution eats away at the weeds on top of the grass...and only the weeds. The grass below is kept pristine, and the weeds themselves are eliminated. The bottle comes in a 32 fluid ounce size, and has a convenient spray nozzle attached. There's no mixing involved; simply spray away the weeds! This product made the last spot on our list because while it ships ready to use with no assembly and no external sprayer required, these conveniences come at a price. The spray is a little bit more expensive than the other options, but not significantly. It's worth it to weigh your pros and cons, especially stacked up against the other contenders, and think about what's right for your garden. 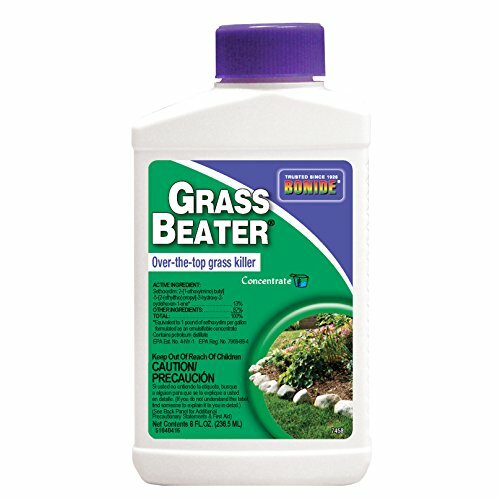 We recommend this product for people who don't want to deal with the hassle of mixing a product or purchasing an external sprayer but want their bermudagrass weeds gone for good. Whether you want to want to rid your garden of invasive bermudagrass, or simply kill the weeds growing through it, one thing is clear: you'll want to do it as quickly (and affordably!) as possible. You'll be able to see results in a couple of days, not weeks. Curious about other lawn related products? Check out our other detailed guides to help you deal with your pest problems. Very helpful Thanks.. I’d like to get emails for stuff like the Best time to apply fertilizer‘s pre-emergence .. helpful things to help get rid of weeds that are existing and to help prevent them in Texas DFW area..